A watershed is the area of land that drains to a particular lake, wetland or stream. The City of Duluth is made up of many watersheds, all connected together like the pieces of a puzzle. These watersheds don't end at the city limits, they are a part of the surrounding communities as well. Minnesota has 81 Major Watersheds. Each defined by rivers, streams, lakes, and wetlands. Follow this link to find your watershed by city or town, or click directly on the map location of interest. Watersheds, also called drainage basins, are made up of all of the land and water areas that drain toward a particular river or lake. Thus, a watershed is defined in terms of the selected lake (or river). There can be subwatersheds within watersheds. For example, a tributary to a lake has its own watershed, which is part of the larger total drainage area to the lake. The watersheds used on this website are a combination of several delineation efforts, including the MN DNR Minor watersheds, and computer-generated watersheds derived from the Soil Water Assessment Tool (Schomberg et al 2005) and a recent high-resolution ArcHydro classification of the Lake Superior basin (Host et al 2010). The MN DNR Minor watersheds (MN DNR 1999) were used as a base layer. The Miller Creek watershed was digitized from the SWCD map and added to the DNR watersheds. Oregon Creek was added to the DNR watersheds from a map developed by the consulting firm Camp Dresser and McKee for the City of Duluth in 2001. The watershed delineation tool within the SWAT (Soil & Water Assessment Tool) ArcView Extension was used to generate new watershed boundaries to define the smaller nearshore watersheds - this discriminated among watersheds aggregated together in the DNR database (Schomberg 2005). Boundaries of the MN DNR watersheds, the Miller Creek and Oregon Creek watersheds were not altered by the SWAT watershed results, but the subwatersheds we used for flow modeling. 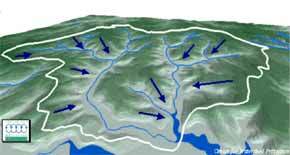 When generating these watersheds, stream lines and elevation data from 30 m DEMs were used to define the drainage patterns; the watersheds are thus limited in accuracy by the accuracy of the stream and elevation data. More recently, NRRI has completed a high resolution delineation of Lake Superior watersheds using ArcHydro, a GIS tool for identifying fine-scale watersheds that maintains the connectivity of one watershed to another (Host et al 2010). This work, based on 10 m DEMs, resulted in approximately 131,000 subcatchments for the US and Canadian sides of the Lake Superior basin, with an average catchment area of 93 ha (230 ac). The analysis ultimately identifies ~1750 streams entering Lake Superior (excluding streams draining from Isle Royale or into Lake Nipigon). Maps created in this analysis can be viewed and downloaded here (NRRI Website). The ArcHydro delineation formed the basis for the stressor analysis conducted for the St. Louis River, the major US contributing watershed to Lake Superior. Schomberg, J.D., G.E. Host, L.B. Johnson, and C. Richards. 2005. Evaluating the influence of landform, surficial geology and land use on streams using hydrologic simulation modeling. Aquatic Sciences 67:393-548. Want to learn about watersheds? Individual Streams -- Open the overview page for North Shore or Duluth streams, scroll down to the data table, and click a stream's entry in the "Landuse Data" column.